Upon the 2006 debut of Freedom of the Seas, it was Royal Caribbean's largest and most innovative cruise ship ever. This "mega ship" sails year-round from Port Canaveral, Florida (only about a 45-minute drive from the popular theme-park-filled city of Orlando) sailing on 7-night cruises to the Eastern and Western Caribbean. Freedom of the Seas was the world's first cruise ship to have its very own surfing simulator, FlowRider®, which can now be found among its sister ships and the Oasis Class ships. 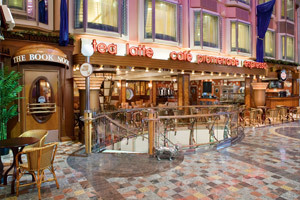 There are many dining options available on board Freedom of the Seas. 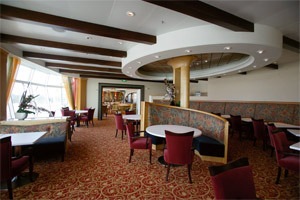 Among them are the main dining rooms, Windjammer Café (featuring buffet-style breakfast and lunches), Cafe Promenade (a 24-hour cafe featuring light menu items), a of couple upscale, specialty restaurants (that each have a per person cover charge), as well as room service. Royal Caribbean allows its guests to select between Traditional (assigned) or My Time (open) dining for dinner, giving them the freedom to enjoy their vacation as they'd like. As far as accommodations go, there are many great options available on board Freedom of the Seas. Among the possibilities are inside staterooms, ocean views, balconies, junior suites and full suites. Accommodations range in size from 152 all the way up to 1,406-square feet, including rooms designed specifically for families. You should never run out of things to do while on a Freedom of the Seas cruise. Whether you decide to relax and enjoy yourself at the full-service spa, have fun at the outdoor children's aqua park, The H2O Zone, or enjoy the Latin-style atmosphere, while dancing the night away, at Boleros Lounge, you're sure to have a wonderful time! 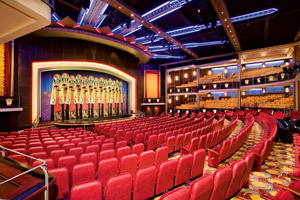 Since March 27, 2011, Freedom of the Seas boasts many exciting enhancements. An outdoor poolside movie screen was added, as was a 3D movie theater, Royal Babies and Tots Nursery, the BRITTO Gallery, The Cupcake Cupboard, Vintages Wine Bar, touch-screen signs, enhanced WiFi service, as well as Chefmakers Cooking Academy®. Since its March 27, 2011 cruise, Freedom of the Seas features the DreamWorks Experience, the result of a partnership between Royal Caribbean International and world-famous DreamWorks Animation®. This special program includes meet and greets, live shows, parades and 3-D movies, including favorite DreamWorks characters (such as those from Shrek®, Madagascar™, Monsters vs. Aliens®, Kung Fu Panda® and How to Train Your Dragon™). 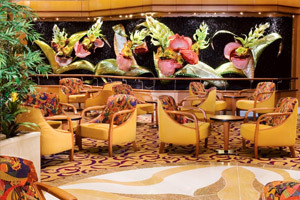 Freedom of the Seas was the first cruise ship to ever have this Royal Caribbean signature feature. It's a surfing simulator that's often one of the most popular places to be at on this ship. Lessons from the ship's staff experts are available for those that don't feel comfortable "just going for it." 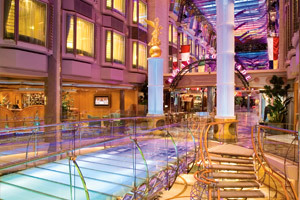 Take a walk down this four-story (mall-like) area, also known as the heartbeat of Royal Caribbean's Freedom of the Seas. While walking through the Royal Promenade, you can enjoy its many bars, eateries and shops. This is definitely one of the "places to be" on a Freedom of the Seas cruise. For those looking to experience a moment from the past, you are sure to encounter this when you enter this surreal disco that is decorated like a medieval castle. 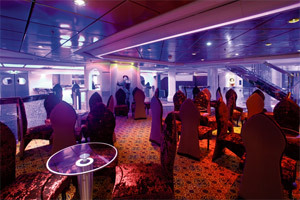 This two-tiered venue is one of Freedom of the Seas' hot spots during the evening of each cruise. Simply enjoy yourself while you dance the night away! Bring out your inner child and enjoy this colorful and unique interactive waterpark for children of all ages. 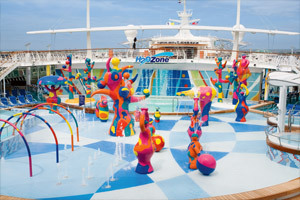 This innovative waterpark became the first of its kind when Freedom of the Seas debuted, with its one-of-a-kind sculpture fountains, ground geysers, cascading waterfalls and more. 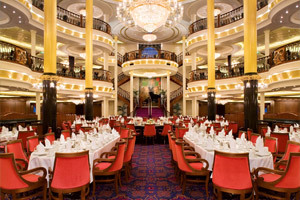 Low Price Guarantee on all Freedom of the Seas Cruises! Book any Royal Caribbean cruise with us and you'll get the best deal possible, regardless of the ship or sail date! Because of our "Low Price Guarantee," nobody beats our Freedom of the Seas cruise prices, so look around and you're sure to find the best Freedom of the Seas cruise deal possible when booking with us! 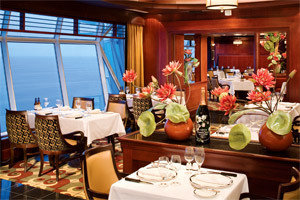 Pre-Paid Gratuities on Freedom of the Seas Cruises! Freedom of the Seas Onboard Credit Sale! Get an Onboard Credit when you book a Freedom of the Seas cruise with us. The value of the Onboard Credit depends on the particular cruise and accommodations you book. Onboard Credit values are listed on Step 3 of the online booking process. We do not charge booking fees on any cruises! You're sure to enjoy an affordable Freedom of the Seas cruise when booking with us! 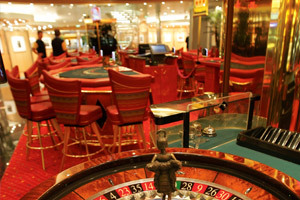 Our special offers on Freedom of the Seas cruises may not be combinable. Certain restrictions apply to each offer. View terms and conditions during the online booking process. Click a price below to view the Freedom of the Seas cruises during that month in that destination. Separate bedroom with king-size bed, private balcony, living room with king-size sofa bed and private bathroom. Two master bedrooms with baths. Two additional bedrooms, each with two Pullman beds and two twin beds that convert to a king-size bed. Two additional bathrooms with showers and a spacious living area with a sofa bed and dining table. Private balcony with dining area and lounge chairs. Please note: In order to reserve this stateroom, a minimum number of guests may apply. To reserve this stateroom, please contact us (as it cannot be reserved by booking online). Queen-size bed, private balcony, private bathroom and a separate living area with a king-size sofa bed. Two bedrooms with twin beds that convert to king-size beds (one room with third and fourth Pullman beds), a private balcony, two bathrooms and living area with double sofa bed. Two twin beds (can convert into king-size), private balcony, sitting area (some with sofa bed) and private bathroom. Two twin beds (can convert into king-size), sitting area (some with sofa bed), private balcony and private bathroom. Rates vary from deck to deck. Two twin beds (can convert into king-size), sofa and/or Pullman beds, sitting area and private bathroom. Stateroom can accommodate up to 6 guests. Two twin beds (can convert into king-size) and private bathroom. Two twin beds (can convert into king-size) and private bathroom. Stateroom can accommodate up to 6 guests. A view of the Royal Promenade with bowed windows, two twin beds (can convert into king-size) and private bathroom. Deck plans provided are subject to change, and are for May 17, 2015 through April 24, 2016. We reserve the right to correct errors. Please verify all information with the cruise line directly.